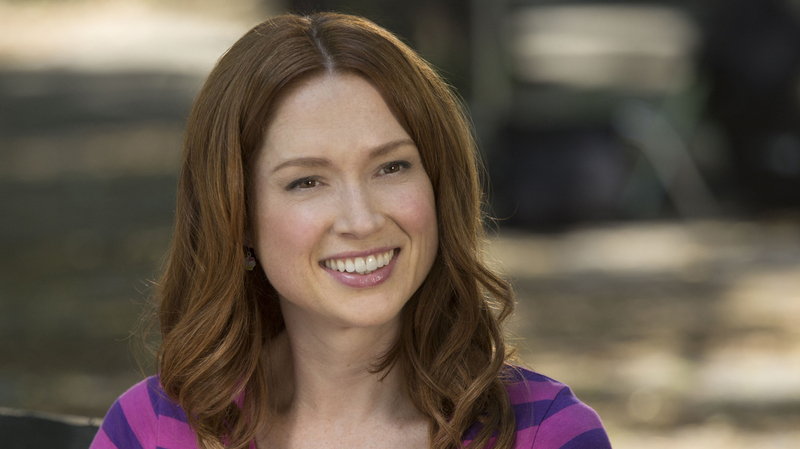 For Ellie Kemper, Kimmy Schmidt Is Just Her Latest 'Weirdo' Role "I still am not sure what in my face screams 'bunker-cult victim,' " Kemper says. The actress plays a woman who was rescued from an apocalyptic cult in the Netflix series Unbreakable Kimmy Schmidt. Ellie Kemper plays a woman who was abducted and forced to spend 15 years living in an underground bunker before being rescued in the Netflix series Unbreakable Kimmy Schmidt. Kemper is also known for her role as Erin, the cheerful receptionist on the NBC series The Office. It's not every day that an actress has a television show written specifically for her, but that's exactly what happened with Ellie Kemper and the Netflix series Unbreakable Kimmy Schmidt. "I still am not sure what in my face screams 'bunker-cult victim' to [show creators Robert Carlock and Tina Fey], but something did, so they went with that," Kemper jokes to Fresh Air's Ann Marie Baldonado. On the Netflix series, Kemper plays a woman who was kidnapped by an apocalyptic Christian cult leader and was rescued after living for 15 years in an underground bunker. Now free and forging a new life in New York City, Kimmy has to make up for lost time. She gets a job and tries to find love and earn her GED — all with a defiant optimism that belies the darkness of her past. Making a comedy about such a serious subject can be tricky, but Kemper says the series tries to focus on Kimmy's future rather than her past: "It's a story about moving forward and ... survival," she says. "I was never worried about the tone or how it would be executed because Robert [Carlock] and Tina [Fey] were at the helm. ... I think if anyone can pull something off like that it's those two." It's so funny because we get these lines that basically they are presented on the most beautiful platter to you; you just have to say them. You don't have to dress them up in anything, and a lot of the time Tituss [Burgess] and I or Carol [Kane] and I will say, "I don't get this joke," and I've Googled jokes before, that I don't get, and even Google sometimes doesn't have the answer for me. I don't find it so far removed from my actual self, the idea of not understanding current references or things that have transpired in the past 15 years. While I certainly did not undergo anything as traumatic as Kimmy did, I weirdly did not watch a ton of television or movies when I was growing up, and I don't find it so far removed from my actual self, the idea of not understanding current references or things that have transpired in the past 15 years. Because, for example, I'm not on social media. I'm not even proficient at technology, so I find a lot of the things that Kimmy says to be upsettingly close to what I actually in real life experience. My husband — he's a comedy writer, and he's constantly stunned by what I don't know, what I missed out on. He's like, "What were you doing during your teen years?" And I always say, "I was hanging out with friends! Because I was well adjusted." But anyway, in terms of playing Kimmy's naive side, there is always a danger of that being grating or obnoxious for people to watch, so I think it's just a balance of she is so sincere in her lack of knowledge, I guess, and she's so determined to catch up on it, I think that playing it very sincerely helps to alleviate the risk of appearing grating or obnoxious in the fact that she doesn't know a lot of stuff. Then, I think, in the following February, they called me in for this four-episode arc for a temporary receptionist who was filling in when Pam went to the Michael Scott Paper Co. [on The Office]. So they called me in to audition and I read with Ed Helms [of The Office]. ... [Erin, the character] was more serious and a little bit more sarcastic, I think, at the beginning, and then I fear that as the writers got to know me, they sort of made Erin weirder, so that's sort of how she morphed into the weirdo rube that she became. It was so crazy once we started seeing his face on buses and billboards as Don Draper [in Mad Men], which was just like, "Wait a minute, that's Mr. Hamm? He's this arresting matinee idol." ... It was so cool to see that. By the way, I have to tell you, that I came out to Los Angeles to put on this one-person show I had been staging, trying to get an agent and a job, and I was in Los Angeles doing it and this was, like, the first season that he was on Mad Men, and I emailed him just to see if he might remember me and if he would come support me at my show, and he wrote right back and he was front row in that show, wearing his St. Louis Blues hat. ... I will say, he sort of stole the spotlight a little bit, everyone was like, "Jon Hamm is here," but that was fine with me.